Check back often, and like us on Facebook. Each instrument is lightly restored not to take away from it’s character, and is set up for playability. We do repairs on most instruments depending on its condition and the repair work itself. We will go over the entire repair process and expected results with you. We do not take in instruments for repair where we feel we cannot guarantee 100% satisfaction from our customers. 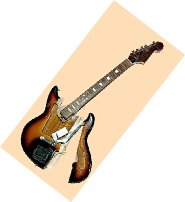 We deal in rare hard to find Guitars, Ukuleles, Mandolins, Banjos, and effect pedals. Guitars and other string instruments are our passion. Each has a different personality and story, with it’s sound and appearance changing with age. Throughout the century, they are works of art. We are looking for older string instruments. Check you attic, closets, and basements for no longer needed guitars, mandolins, ukuleles, and banjos. We will make offers based on year and condition. So free up a old friend and give it a “New Life” . Give us a call! Not only to we sell our own inventory, we are willing to take the hassles and burden of advertising and selling away from you. We sell on commission or consignment. We take pride in providing all the information possible for buyers to make a logical decision on their purchase. We provide buyers with descriptions, pictures, videos and sound bits of what you have to offer.